This post is about how comforting it is to have friends along with you on the road. This is a picture I snapped last Sunday of my friends Jason and Chava playing at Café de Beligique. Jason and I figured out that we've known each other 2/3 of his life (a little more than half of mine). This past week he and Chava stayed with me for a few days to save hotel room costs while they were in Amsterdam. I was a bit worried about what it would be like to share a room with two other folks, but it was *lovely* to have them along. We visited some old friends one night in Utrecht. Another night we just hung out and played music in the hotel bar downstairs. Normally I don't have so much fun on the road, but this trip was a rare exception. Thanks, kids! 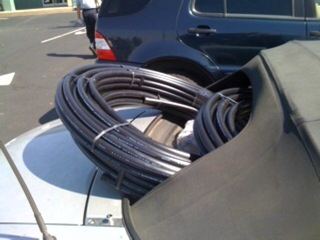 Really funny day trying to bring home 400' of PVE tubing for making hulahoops...No wonder so many people drive SUVs. Miatas are not cargo vehicles. But the good news is that I'm (mostly) back in the saddle now. Allowed to work again (finally). And this is very good news because, as anyone who knows me will tell you, I love to work. I'm going to try not to work so much that it hurts me in future, however. But I will return to blogging. Those of you who know that I helped Sun start blogs.sun.com , and I believe in the value of blogging (SPAM comments notwithstanding). I want to thank my family, my very good friends, my health consultants and Intel for being very patient with me as I've been in recovery. I couldn't have asked for more support. Curiously, a number of prominent Open Source advocates have contacted me for advice lately because they are showing greater or lesser signs of burnout, so I'm not feeling like the only one. I'm thankful that I got this wakeup call at a time when I could listen and I'm hopeful that others will learn from my experience. I've learned that it can really hurt a body to travel the way I was traveling (and maybe to live the way I was living...It's been said before, but 24x7 access to the community may be a problem. I've learned that I'm not 20 years old anymore and that I need to pace myself for the long haul instead of working like there's no tomorrow. If you're curious, I'm happy to type more about what my symptoms were and what therapies I pursued (am pursuing, because some of them are "lifestyle changes")...but I'll wait to read comments before I launch into all of that. Better to type about the inaugural Linux Foundation Collaboration Summit, where I am hanging out with Allison Randall, Zaheda Bhorat and a couple hundred of my "closest friends" today (see next post). BTW, Have to take a moment to add to the many congrats to Sun and especially to the OpenJDK Team for finally pushing Java (the language) out under GPLv2. I was at JavaONE, but as it was a month ago I wasn't supposed to be there working and certainly not blogging. Still, I'm really pleased to see another Open Source Java joining GNU Classpath/Kaffee and Apache Harmony. Its about time!